Overview - Lurking beneath the glamor and spectacle of the Paris Opera House, the horribly disfigured Phantom, once a promising musician, now terrorizes the opera company. Shamed by his physical appearance and feared by all, the Phantom is drawn to the beautiful ingénue Christine Daae and begins coaching her secretly, as a tragic romance unfolds between the unlikely pair. This dazzling live restaging of the original production recreates the jaw-dropping scenery and breathtaking special effects of the original, set to Andrew Lloyd Webber's haunting score. Bathed in dramatic lights, magnificent sets, and sumptuous costumes, 'The Phantom of the Opera: Live at the Royal Albert Hall' is an elaborate production of the famous musical, celebrating its 25th anniversary with style. While I've seen pieces of the Joel Schumacher adaptation, this was my first real exposure to the Andrew Lloyd Weber classic. In fact, my only other experience with the show involves memories of my mother playing the album on an endless loop during long car rides and family vacations, causing the repeated melodies to invade my dreams while I tried to sleep in the backseat. Despite that fairly negative association, watching this version of the musical in its entirety has certainly broadened my appreciation for it, and thanks to some beautiful music, strong performances, and breathtaking production design, this filmed stage show really shines. The story focuses on a beautiful young singer, Christine Daae (Sierra Boggess), as she becomes the object of desire for a mysterious, masked stranger (Ramin Karimloo) who haunts the Paris Opera. By threatening violence he forces the managers to cast Christine as the star in their show, and slowly attempts to seduce her. Fed up with his demands and shadowy actions, the company bands together to fight off the disfigured menace once and for all, but as Christine's emotions grow more complicated it seems like the Phantom's allure might ultimately prove too strong to escape. Filmed during a special live performance at London's famous Royal Albert Hall, the movie features a variety of angles and set ups that help to pull the audience into the action without ignoring its stage production roots. Wide shots, sweeping overhead angles and audience POVs all add a level of grandeur to the proceedings. Frequent close-ups reveal tiny details and facial expressions, giving viewers an intimate look at the show. Tracking shots, pans, and dissolves all add some cinematic flair, helping to keep things visually interesting. A large video screen rests behind the performers, bolstering the set design with extra background enhancements. The actual production design is simply marvelous, with the show coming across as a true theatrical spectacle. Costumes and set construction are elaborate and colorful, offering a great sense of time and place. Some pyrotechnics add periodic excitement with solid stunt work. The musical numbers are all well staged and the performances are great, taking full advantage of the uniquely expressive power of song. 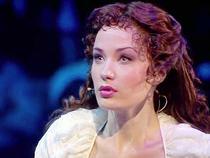 Sierra Boggess is particularly fantastic as Christine. Her voice is amazing, demonstrating great range, and she absolutely lights up the screen with passion every time she opens her mouth. Ramin Karimloo also does a good job in the title role, bringing a nice mixture of menace and pathos to the tragic character without overdoing it. The music itself is amazing, with powerful melodies that will linger in your head long after the curtain falls. The story and lyrics are all well done as well, weaving an epic tale of seduction, obsession, and romance. Some of the diversions involving secondary characters aren't as compelling as the main plot, however, and at two and a half hours, the show can definitely drag at times. Thankfully, though, the good far outweighs the bad, and the production effectively tugs at the heart, showcasing a kind of high soaring bravado that only the best musicals have. Featuring a great cast, striking production design, and the same great story and music that audiences first fell in love with twenty five years ago, 'The Phantom of the Opera: Live at the Royal Albert Hall' offers a great stage show experience. Andrew Lloyd Weber even makes an appearance at the conclusion of the show to introduce an encore performance featuring Sarah Brightman and a few other surprise guests. Though I can't really speak to how this version of the musical compares to others, I can't imagine fans being anything but pleased by this lovely rendition. 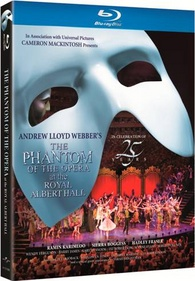 Universal brings 'The Phantom of the Opera: Live at the Royal Albert Hall' to Blu-ray on a single BD-50 disc housed in a keepcase with a cardboard slipcover. Upon initial start up, the disc prompts the user to choose from a variety of languages, and then after some warnings and logos transitions to a standard menu. An insert advertising the sequel production, 'Love Never Dies,' is also included in the package. The musical is provided with a 1080p/AVC MPEG-4 transfer in the 1.78:1 aspect ratio. Shot digitally in high definition, the show's lavish production absolutely sparkles on Blu-ray. The digital source is clean but there is some noise evident in dark, low light scenes. Clarity is exceptional, with every intricate piece of fine detail on the characters' elaborate costumes visible. The show's extraordinary production design radiates from the screen, and all of the complex sets offer a dazzling treat for the eyes. Colors are vibrant and lush, bathing the stage with a kaleidoscope of hues (the masquerade ball sequence is especially impressive). While some wide shots tend to look a little flat, the show's dramatic lighting design does offer several instances of pleasing dimension. Contrast is fantastic, with bright whites and deep, consistent blacks. There are a few fleeting hints of aliasing and shimmering, but they are so brief and minor that they're barely worth mentioning. Fueled by pure spectacle, 'The Phantom of the Opera: Live at the Royal Albert Hall' embraces all of the grandeur and beauty of the stage, enticing the viewer with a simply mesmerizing production. Some shots can look a little flat and noise is visible from time to time, but this really is an incredible transfer that should more than please fans. The film is presented with an English DTS-HD MA 5.1 track and an English Dolby Digital 2.0 track. A plethora of subtitle options are provided, including English SDH, Spanish, and French. As one might expect, the show sounds terrific with expansive range and solid immersion. Dialogue and vocals are crisp, clean and precise. The gorgeous music is spaced well across the soundstage with nice separation and decent directionality for effects. Surround use is mostly limited to audience reactions and echoes of music cues, but the filmmakers do offer some creative bursts of immersion. The Phantom's disembodied voice, for example, will boom from all corners of the room, and other characters' speech will be situated around the listener when appropriate. Dynamic range is fantastic, giving full body to the performers' seemingly limitless voices with no distortion. While not quite room shaking, bass is deep and commanding, lending some pleasing low end punch to the show's more dramatic moments and songs. Balance is mostly good, but dialogue can sound a tad low at times. With beautiful melodies backed by a full orchestra and a talented cast of performers, the audio mix is simply enchanting. While not quite worthy of a perfect score, there really isn't anything to complain about here, and like the video, fans should be thrilled with the audio presentation. Love Never Dies Trailer (HD, 1 min) - Presented in 1080p with Dolby Digital 2.0 sound, this is a brief trailer for the show's sequel. Getting Past the Point of No Return (HD, 18 min) - Presented in 1080p with Dolby Digital 2.0 sound and the same subtitle options as the main feature, this is an interesting behind-the-scenes look at the production. Interviews with the cast and crew are provided along with looks at rehearsals, set construction and the makeup process. 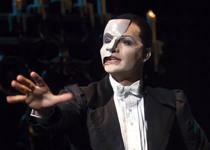 'The Phantom of the Opera: Live at the Royal Albert Hall' is a spectacular rendition of the much beloved musical. With a great cast and lavish production design, the show should more than please fans. Video and audio are both exceptional, offering the next best thing to actually being in the live audience. Supplements are slim but the behind-the-scenes featurette offers an interesting look at the painstaking work done to make the show a reality. While this disc will mostly appeal to viewers who are already fans of the musical, even those who are usually averse to such shows might want to take a look. Recommended.